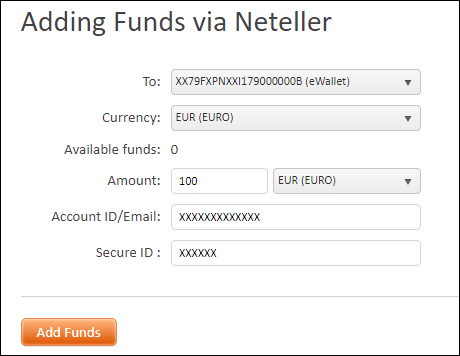 Select Add Funds→Neteller in My FXOpen. Select the account (eWallet or trading account) to which you want to make a deposit. Select the currency wallet and deposit currency. Enter the 12-digit Account ID or email associated with your Neteller account. Enter the 6-digit Secure ID for your Neteller account. Funds will be instantly transferred to your FXOpen account. Deposit fee: 2.5% + 0.29, but not less than 1.29 equivalent of USD in other currencies. Minimum deposit: 2 USD or equivalent.